Early Cat-Blogs were really gung-ho about their daily ritual of pretending to be their cats(s). They developed a cute language for their cats, including abbreviations like mol for ‘meow out loud’ and purrs, which means goodbye. Someone came up with the idea of Caturdays! Caturdays is really where the lolcat paradigm was developed. They started with cute embroidery style graphics to post with pictures of their cats, usually sleeping, hiding under the covers or laying on their backs stretched out. Somewhere along the line one of these hoomans (as they lolcats call them) added some of their cute catspeak to her cat picture and that is when the lolcat was born. Soon other days were added. Tuesday is Toesday or Tocksday where photos of their cats toes or buttocks are featured. Wednesdays became Wordless Wednesday and of course Sundays became ‘Easy as Sunday Morning’ on many blogs. The use of catspeak being added to these photos (except Wordless Wednesday) continued and the paradigm grew. 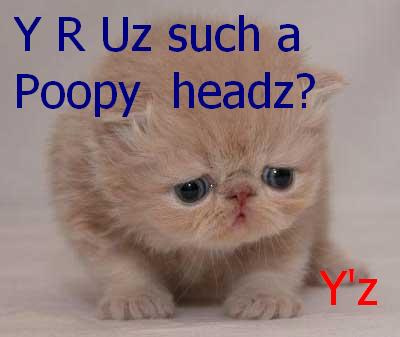 Some college kids picked up on the images with the cute catspeak and in 2003 began posting their own lolcats to 4Chan.org. Eventually Icanhascheezburger.com did the rest of the work. 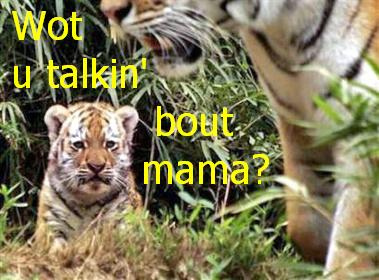 I have made a few lolcats in my time, but none were ever accepted by the Cheezburger site. Do any of you have lolcat pictures you made? I’ll share a few of mine as well as my first lolcat ‘I has a flavor’ (see above). Thanks for letting me share my cat related knowledge on this awesome website! This entry was posted in Cats in Art and tagged Caturdays, humor, lolcats by Michael Broad. Bookmark the permalink. I never thought of it like that before, to be honest. I think it’s fading as well. The genre has been played to death. Yeah, I know about those wonderful cat pix from the 1870’s. I was just surprised that none of the articles I looked at mentioned the evolution of the genre. I think the longevity of the genre tells us about our relationship with the domestic cat. However, I still believe it is a fading fad. Hi Dan, thanks for sharing. However, I think you’ll find the lol cats genre goes back to 1870! Which begs the question why people like to add humorous words to pictures of cats. It is fun but one aspect of it that I don’t like is that it demeans the cat. The genre does not really respect the domestic cat. Not quite for me. Also the genre is dying out. The cheeseburger site gets less than half the number of visitors it got at its peak and the original lolcats site has dived. The owner wanted to sell the site about a year ago. It has to fade away due because it is a fad and all fads and fashions come and go.